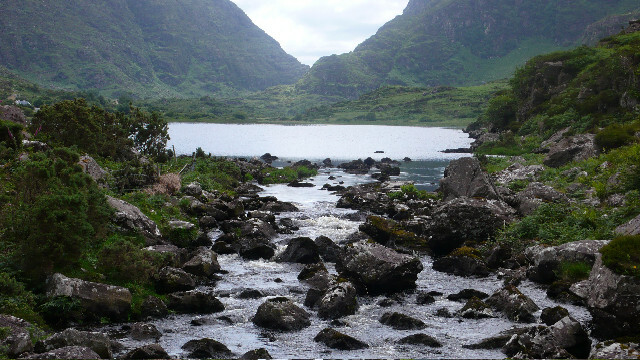 The Gap of Dunloe, County Kerry. One can enter this truly inspiring Kerry valley via the road leading to the famous Kate Kearney's Cottage, there you may park and walk through the Gap or perhaps hire a pony to have a jaunt. One can also procure the use of the jarvey services at a certain expense. Cars are allowed to drive through the Gap, but this has become a contentious point for argument. The Gap is a distance of three miles end to end, having entered via Kate Kearney's Cottage, you will exit into the glorious Black Valley from whence you can travel on down toward Sneem, or circuitously to Kenmare.